Question of the Day: Are You Prepping for Four More Years? With last night’s victory, the big O has secured another four years as your CIC. Based on his legislative history and statements on and off the record, some gun owners are in fear for their constitutionally protected rights. We hear tell that gun, gear, and ammo sales are set to surge even further. Are you stocking up? Self-Defense Tip: Check to See if You Can Carry Where You Vote! I stocked up right before the election. I am simply looking to “top off the tank” now in terms of hardware and ammunition. Just bought 1000 m193 bought 1600 22lr total this month have been buying every month for a year. Prices very high on whatever you are lucky enough to find. Bought a Colt SP1 months ago for an exceptionally good price – it’s preban, and therefore fully NY compliant. I have every gun I’ve wanted to own. So now, my strategy with ammo: no stocking up or hoarding, just setting a baseline amount, and purchasing new ammo at a replacement tempo. thats really all you need to do. you dont need a entire warehouse. I am learning how to field dress and cook animals. With this green economy, my new job is going to be picking berries in the woods and foraging for food in order to avoid starvation. That would sound like a lot more fun if you’d bought 9 250mm rounds and 3030 80mm rounds. The NFA stamps alone would probably erase a healthy micro-fraction of the federal deficit. You bet your a$$ I’m stocking up. M&P 15 sport, Glock 34, and Mossberg JM930 Pro 12-gauge are on my list by the end of next year. M&P 15 Sport is on mine too but I havn’t been able to locate one locally for months. I don’t see that improving for at least a year or more. Well, yes and no. I have a list of stuff I want to add to my collection. 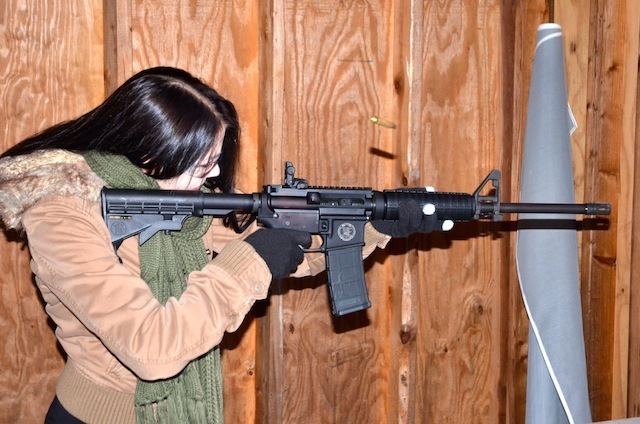 A lot of the stuff wouldn’t likely be banned by another AWB. So what I might do is just push the more ‘mundane’ weapons to the back of the list in favor of another AR or AK. Same here. I’ve wanted another AR and AK for a while, but had always been eclipsed by less “scary” weapons. A complete AK and another AR lower are on the top of my list now. Exactly – the cook cowboy gun and .22 just went to the back of the list. 5,56 and AR stuff at the front. Same! – I was eying a Henry .22. It was nixed in favor of the M1A I have been postponing. Agreed. That Benelli Montefeltro and M1 was pushed to the back burner. Ordered two stripped lower receivers today and a crap load of mags for the rifles and Glocks. Why today? I was able to convince my wife given the outcome of the election. We are at least 18 months from any sort of ban, etc. 1,000 rounds of 9mm delivered today. Funds don’t really allow me to stock up on the fun stuff this year. Hopefully the AWB is held at bay until I graduate in the spring and am employed making roughly 4-5 times my current annual income. Thankfully I chose a recession-proof career in healthcare. Then I’ll be filling a safe, and possibly a stockpile of non-perishable SHTF items. i work in healthcare and was given a severance today due to a clause in obamacare. i hope you fare better. Have plenty of .223 Rem and 7.62 NATO to last me a while. Might stock up on .22LR, .243 Win and .357 Mag. Maybe a few boxes of 1 1/4oz slugs as well. Planning to get some bulk of my two primary calibers then sit back and see how things go. I find the politically-induced buying to be somewhat puzzling. If more people knew how to reload, they wouldn’t keep forking over huge amounts of money for ammo, they could afford to shoot more and they’d learn something (which is never bad). If more people knew how to reload, they’d quit being so easily spooked by this sort of news and they’d live calmer lives. This. Other than the AR “off-list” lowers I already have on order (getting two since they’re cheap) a nice progressive reloading setup is at the top of my acquisition list. DG, at the risk of igniting a reloading-press holy war, which models from the “complete-but-not-ridiculously-tricked-out” class of progressive presses do you like? Good question AG. 30 years ago I used a basic rock chucker to reload. I’m curious as to what more experienced people than me have to say about current reloading set ups. I’ve been reloading for, oh, going on 20 years. And I use a single-stage press. I’ve flirted with progressive presses, helped a bunch of buddies with progressive presses, and I might, due to old age and impatience, get a progressive. But I’ve sure as heck reloaded a lot of brass on a Partner, Rock Chucker, Lee and other single-stage presses. They’re so damn cheap at sales when you find them. What I’ll do is set up several of them in a row – one to decap, one to prime/size, one to throw powder, etc. In effect, I’ve eliminated the biggest downside to a single-stage press – having to change the dies or toolhead all the time. I’ve picked up single-stage presses at estate sales and yard sales for as little as $10. The family didn’t know what all was in the departed old man’s stuff, they knew the press was used for something (“He spent a lot of time fussing with it, it couldn’t have been all that good…”) and they let it go cheap. The reality is that they’re built like a brick outhouse, they’re so simple that not even a caveman can screw them up and they will do everything anyone needs. That would be one of the downsides of living in the SF Bay Area in 2012. Virtually all of the old guys who had reloading presses, decent tools, or even home machine shops are long gone. Whether it’s machine tools or firearms-related stuff, I pretty much have to buy new. Love my Dillon XL650 setup from Brian Enos. I’ve turned out about 3,000 rounds of 9mm with a few different powders and bullets and found adjustment and consistency to be good. At a leisurely pace I can put out about 400 rounds per hour. I’ve also got a set of 45ACP dies that I haven’t set up yet. I also want to start loading .30-06 for my CMP Garand. In that vein, my “stocking up” recently has been ordering 2k bullets, and 4k primers. Already have plenty of brass and powder. Thanks, I’ve heard a lot of good stuff about the XL650. How often do you get a bad round out of it? Causes? Dillon BL550, which you can upgrade to automatic powder and primer. The RL550B is perhaps the most versatile press with the best overall track record, IMO. There are others, certainly. But here’s the thing: You don’t need a progressive press to reload big numbers. You need to work in stages. Make a bunch of reloading blocks – out of 2×4’s or 2×6’s. Get a 0.500″ (for .308, or 7/16th’s for .223) two-flute end mill and drill a matrix of tools into the block to hold your cases. Use an end mill rather than a twist drill, because then you get a square bottom hole. Then you run 200 or more rounds through each stage of the reloading, then change your dies, power throw, etc and run them through again. And so on. You can pick up a basic, single-stage press at garage sales, used in gunshops, gun shows, you name it. An old Rock Chucker press is a rock-solid press with which you can do literally anything, including forming brass for wildcats. Some of my end mills have probably spent as much time cutting wood products for random projects as they have cutting aluminum or steel. Great suggestion on the reloading blocks. I’ll definitely take a good look at the 550 series. Thanks for the advice. I’ve not been active in shooting lately, so my reloading has also been stagnant. I must have 1,000 s of .45 Auto and .30-06 cases waiting for the process. Reloading really isn’t an option for me, living in a one bedroom apartment. Unless you have roommates in your 1-br apartment, there are reloading setups that require very little working space. You can mount a single-stage press on an Ikea stool. You won’t crank out 5000 rounds/hour with that setup, but you WILL be steadily restocking your ammo supply. Not true, Carlos. I know how it is. I’ve lived in a 1BR apartment. I’m here to tell you, that for a great many cartridges, you can reload, and you don’t even need a bench. There are two hand reloading tools out there – the Lee Hand Press and the Lyman 310 tool. For straight-walled pistol and revolver cartridges, these are more than sufficient to reload a bunch of ammo in an evening. When you’re done, the ammo goes into ammo boxes, and hand press, dies and other stuff goes back into a box under the bed. Done deal. OK, moving up in size: Look at something like a RCBS Partner press, or a Harrell Precision compact press. Both are small, single-stage presses. I’ve reloaded a heaping pile of brass on a Partner press over the years. You can set these up with a c-clamp and the edge of a table if you want, or you get a bar stool and c-clamp them to that. Don’t laugh, it works. They’re so small that, again, you can put them into a box under the bed when you’re not using them. The only problem with reloading is states like Maryland limit you to 4 pounds of powered. That would be a lot of rounds when it comes to handgun but some of the larger rounds could burn though that pretty quick. Although I agree reloading is a good idea. New 5.56 upper en route, and Mossberg 930 if’n I can sneak it past the wife. After you get the shipment, slip the stock/action assembly down one pant leg and the barrel down the other. If you move slowly, you should be able to slip it past her. Wait, that’s not what you meant, was it? Trying to stock up now is like waiting til Sandy comes ashore to go to the store. You should always have a stock already put aside. I’m not just talking about guns and ammo. Food, water and other essentials should be held in reserve for any of lifes hard knocks. It’s not just our guns at risk. In this economy you need to be as prepared as possible for hard times, they’re just a paycheck away for too many people. I live debt free, no house note, no car note and for sure no credit card load. And even though I’m retired I’m dipping a toe back into the job market- xtra income can’t hurt in days like these. This. We live in earthquake country so we’ve been slowly increasing our stocks of ammo, food, water, etc. for quite awhile. Still a long way to go, though. The big one better not hit for another year or so. Trading in the Mini 14 for a PTR 91, and selling my 870, Springfield XD45, and all of my Mosins for a VEPR 12. I pulled out my AR today. Looked at it. Pistol grip. 6 position stock. Bayonet lug. Flash hider. Decided that since the antis find all of these mundane attachments “evil” my AR needs a sibling. Ordering a new lower and parts kit as soon as I get my next paycheck. Just in case. Thinking about getting into reloading too since ammo is getting too dang expensive. Ohhhhh yeah, time to stock up. Yes. I am fairly well stocked on 5.56 and 45 ACP. I loaded up on mags for those and the M1A in anticipation months ago. Bought an M1A last night and now I need to dig deep and get my 308 ammo, ugh! Hell yes. I was pretty well prepared before but still bought a maten, gtr-3s, mags, and more ammo today. I now need to snag some mags for my m1a and find a ton of 308 ammo. Once he starts banning then i will concentrate on optics. I need to buy a lower or two and then I’ll be fine. I have all the firearms and mags I want & just buy some ammo for each on payday. I am more concerned about natural disasters vs. FUD from gun owners about gun grabbers. If I was, I wouldn’t be bragging about it on the internet. Just commenting on this site will get you on the radar, if that’s what you’re worried about. Op sec starts with not having a computer or cell phone. Too late for most of us. You can do more than track it if the battery is in. Im paying off my laway for a PSA M4 with a Vortex Strikefire Red/Green Dot optic. Just bought a 10 pack of standard 30 round Pmags through Brownells for $125 ($150 with second day shipping). My local Wally World carries Federal 5.56 in bulk, just over 400 rounds. Overall I am a happy camper. I am not so much in fear of an AWB in the (immediate) future but a ban on imports most likley. Im ganna try and get a few Mosin 91/30s soon. Comments about boating accidents aside, my buying patterns have not changed. I have a few weapons, and a decent stock of ammunition. I have a few more weapons in the “plan pipeline,” but that’s no different today than it was a week or a month ago. I will buy more ammunition when I get a deal, and I’ll continue to throw a box of ammo in the cart every time I set foot in WalMart, because that’s how I keep my stock “topped up.” I’m not panic-buying, and I’m sure as @#$% not paying marked up prices from people trying to capitalize on the hype. I’ve seen this coming for four years and acted accordingly. God help us, sleep well sheeple. No offense to you specifically, Joseph, but I hereby nominate “sheeple” to be about the stupidest word in common use on this site. I feel a little dumber every time I see it, and it generally makes me think a decent amount less of whatever comment it appears in, no matter how cogent and well-reasoned the rest of the statement is. Thanks for the laugh Matt and I sort of agree. Also no offense here Joseph. But Matt I have to ask how else would you describe some of the antis? I do find the terms sheep and wolf dog to get a bit bothersome but there are so many people who just dont care, they follow the flock. They remain defensless and expect others protect them. Unfortunatley, for many the term sheep just fits. I’m getting a license for sheeple-season as soon as I can get more lead free ammo. When are we storming the castle? +1. I’ve been buying a little every two weeks for over a year. Let’s just say I’mna not interested in leaving an online audit trail, nicht wahr? 1 – Bought 400 rds. of 30-06 for my M1 Garand. I am in good shape with 5.56 and 9 mm and high capacity mags. 2 – Bought a 5 year membership with the Second Amendment Foundation. I already belong to the NRA. Bought a Windham armory ar-15 mpc today at Cabela’s and 15 were sold before I got there at 11am. FYI, you can track cell phones that are turned off. You have to remove the battery from the phone in order to ensure it’s not being tracked. Using an anonymizing service and/or onion router can help to keep keep your online presence more private. Having said all that you still have to practice security on top of that which was mentioned. I’ve been stocked up but, I bought a reloading setup. FUD sells, but I ain’t buying. I just wish all you last-minute panic buyers weren’t driving prices up on the ammo that fuels my weekend shooting habit. does 6 guns in 1 year count as stocking up? but not enough ammo, i plan on getting more in a lil bit. Soooo… I haven’t bought anymore ammo. Or even guns. I’ve got enough that I fell comfortable. However, I did buy as much powder and as many primers I could afford over the last 4 years- mostly because it doesn’t go bad if stored properly. Also stocked up on unfired and once fired brass. Fully realizing it makes me sound like a paranoid looser, I also bought a spare bench press and dies for all my calibers. I rationalized it as allowing me to have a buddy help- but it’s really just for “oh crap I broke something” moments. Bought another AR lower and a X-14 50 rnd drum mag last night to mark the election. Bring on the doom. Nope. I do have a long list of guns I’d like to own, but most are not legal in California and/or far exceed the available budget. And if everything goes upside down, my wife and I will die anyway when our pharmacy supplies run out, so there is no point in stocking up beyond immediate needs. 440 rounds for the Mosin,still can get em cheap but i feel they will rise in price.Gotta start reloading and learning,esp for my mighty 10mm. Just completed my HiPoint Carbine collection (45 ACP, 40 S&W & 9MM now in my possession), picked up the M1 from CMP and most importantly, not getting rid of anything else I currently own. Nothing else to load up on that I need, other than to buy stock in Ruger & other gun cos. that will undoubtedly go up as a result of the election. You gotta love the free market!